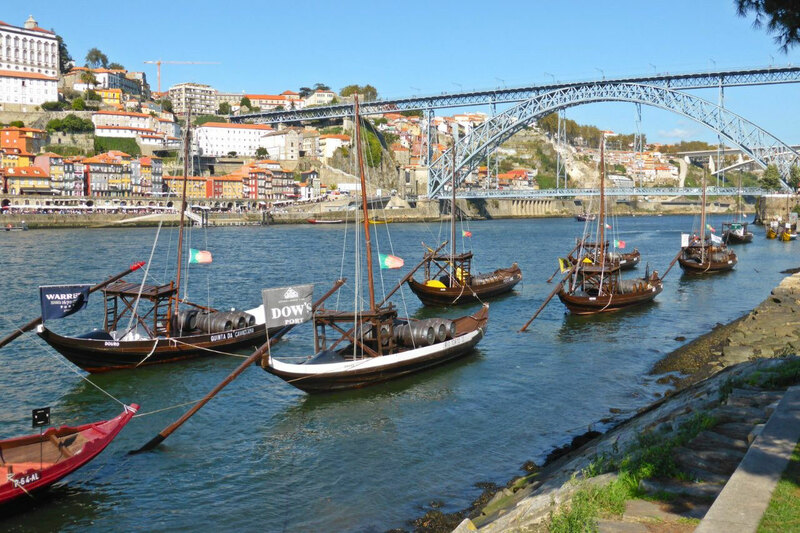 Porto is a port city on a river estuary, not far upstream from the Atlantic Ocean. 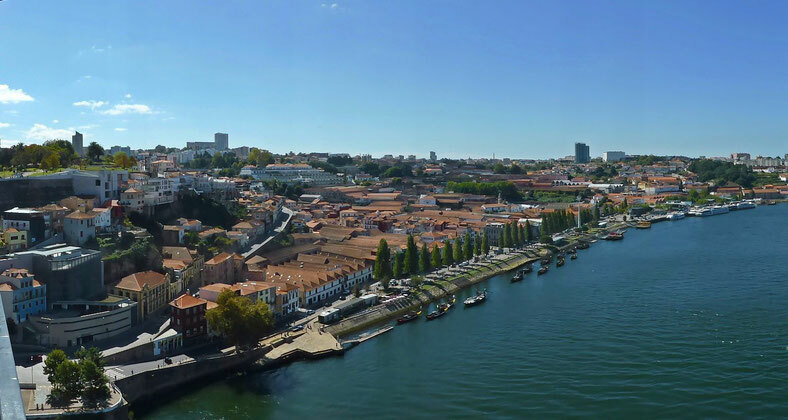 As we approached Porto, I had a mental image of it on a low, flat, bank of a serpentine, meandering river like Brisbane or Perth, or London on the Thames. 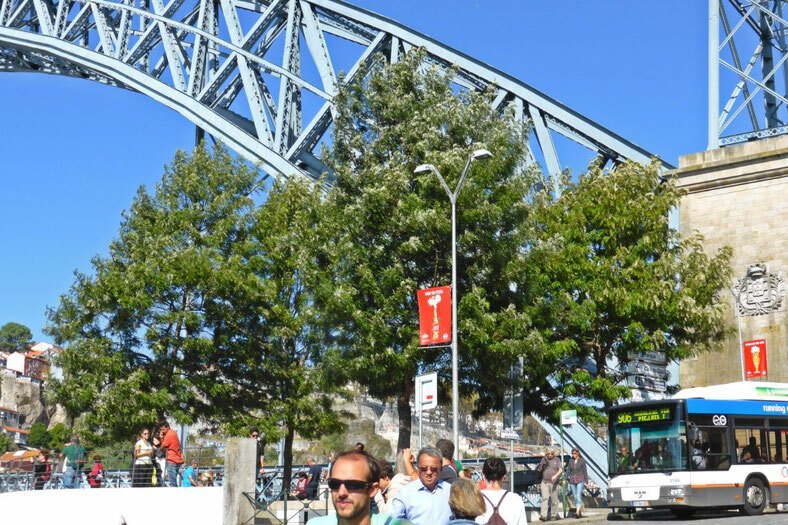 So, I was surprised when our bus crossed the Douro River on a bridge very high above the water. The Douro River, which runs adjacent to Porto, runs in a deep and, in places, steep-sided chasm before it meets the sea. 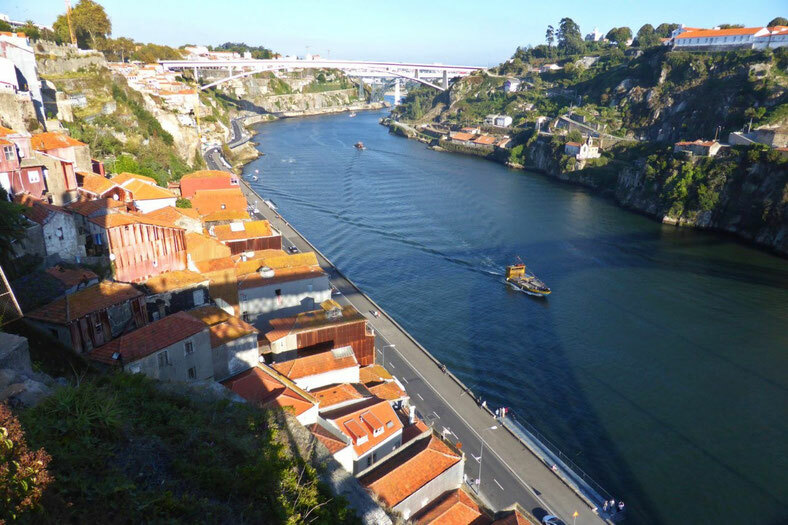 Porto is, in part, built up the north side of the chasm. On the south bank of the Douro River is Vila Nova de Gaia, a district that has long housed port-wine-industry cellars, as well as being a residential area for Porto. They're close together and a little out of town, so it's hard to see that there are two bridges. The more distant concrete bridge is Ponte de São João (St John's Bridge), which is a railway bridge. 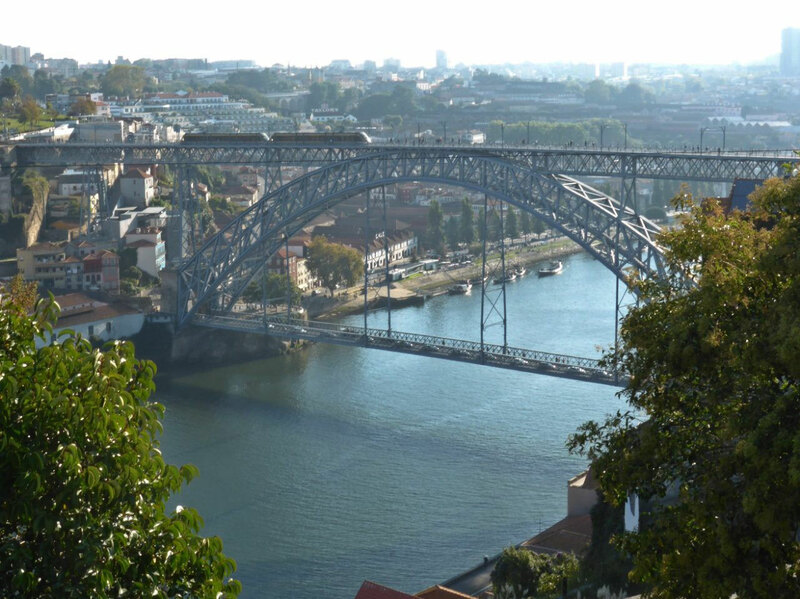 The closer bridge is the Ponte Maria Pia (Maria Pia bridge) built in 1877 by Gustave Eiffel, of Eiffel tower fame. It looks a bit like the Sydney Harbour Bridge, but with the travelling surface on top of the arch, instead of suspended underneath. As far as I can determine this bridge has been superseded by the Ponte de São João, and is no longer used for anything other than decoration of the river, which it does very nicely. The next bridge downstream is the Ponte Infante Don Enrique (Infante D. Henrique Bridge), a graceful, modern (2003) concrete, arch-supported, box-girder road bridge. 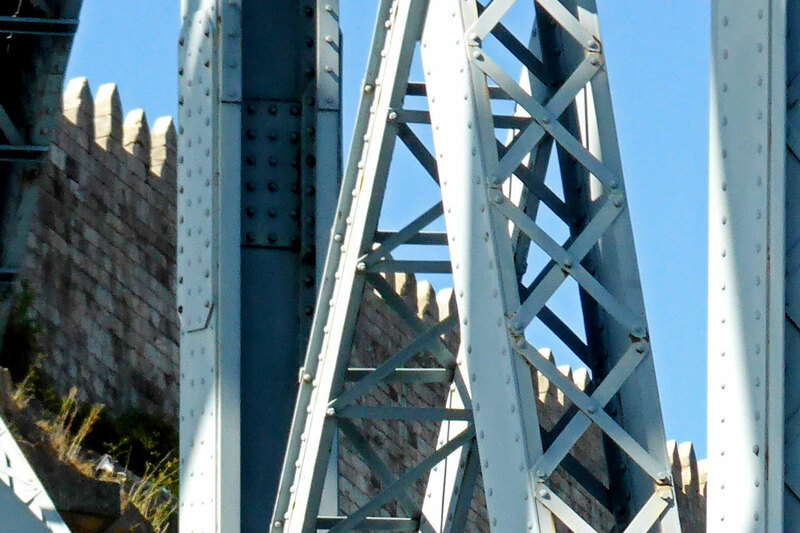 This bridge was designed by one of the engineers who worked on the Ponte Maria Pia for the Eiffel company, and is a closely related design. The bridge has two decks, one suspended below the arch at the waterfront level, and one set on top of the arch at the cliff-top level, to accomodate the terrain that Porto is built on. Originally, both decks were used for a mixture of private and public transport; however in 2003, with the opening of the Ponte Infante Don Enrique, the upper deck has been converted for use by the Metro system, with pedestrian decks. 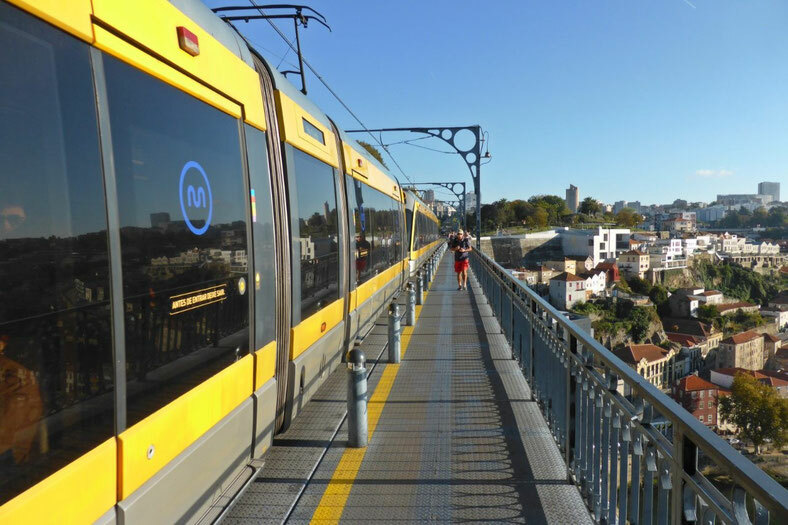 There's not much separation between the Metro trains and the pedestrians as the train travel across the bridge at 20 to 30 kph, and the tourists are always walking backwards while looking at their camera or smartphone monitors, but I didn't see anyone get run over while I was there. There's lots of Australian gum trees in Portugal, but there's other Australian trees as well. At the Vila de Nova Gaia end of the Ponte Luis I there is a small stand of silky oaks! 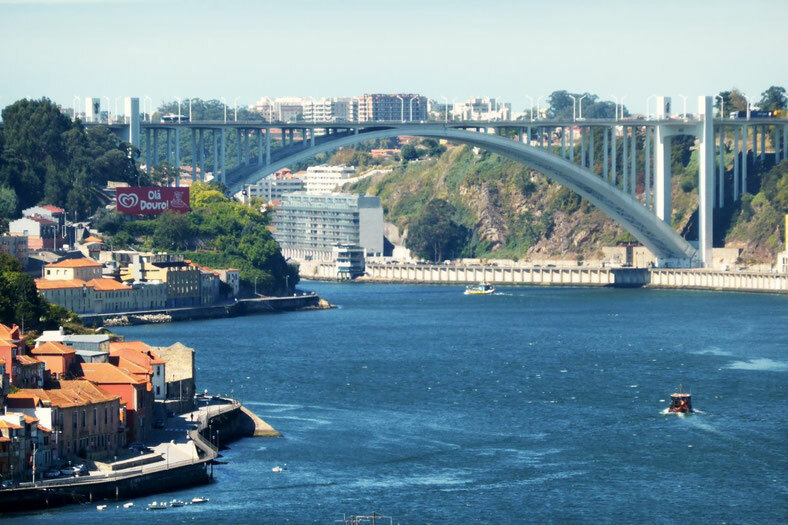 The remaining Ponte de Arrábida (Arrábida Bridge) is well downstream fron the main part of Porto, so I didn't get very close to it. 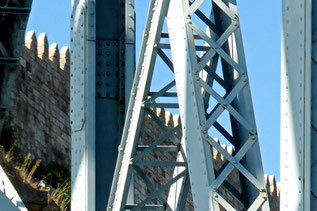 It's a concrete arch bridge built in 1963. It carries a major European highway, and so has six traffic lanes. 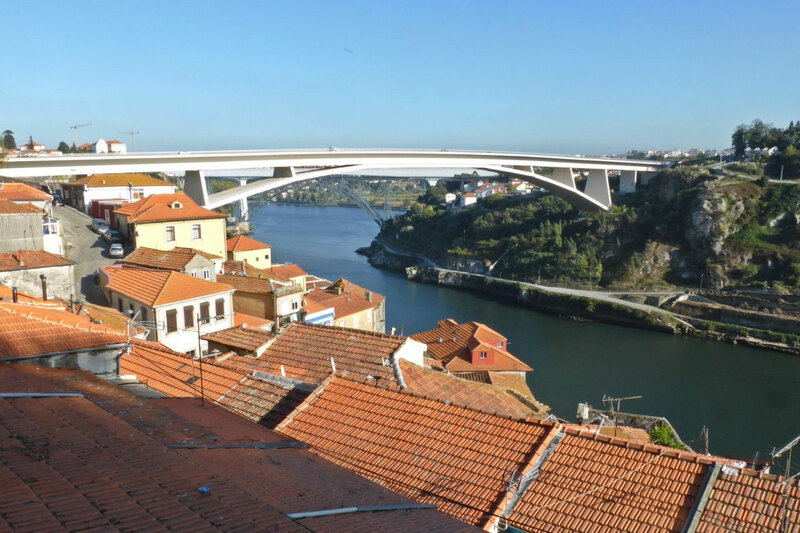 Again, its a spectacular and beautiful bridge, high above the Douro River. 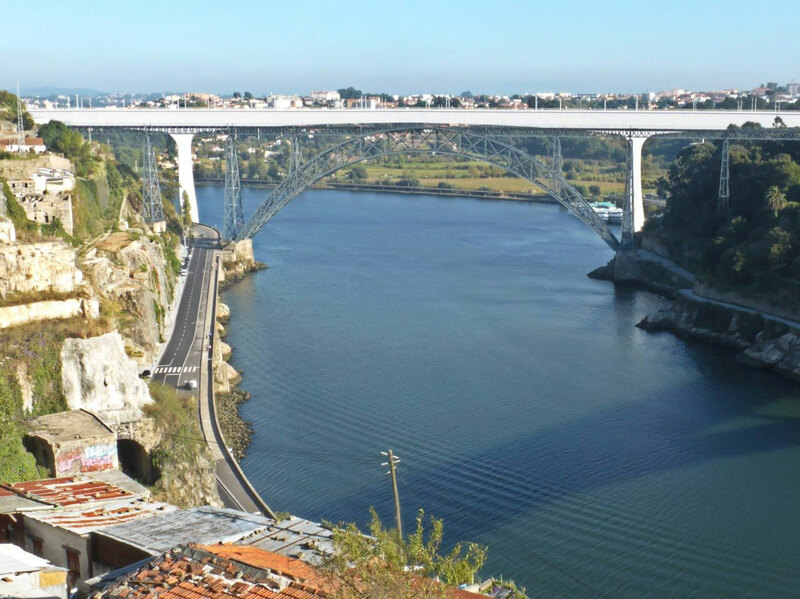 There is one more bridge that forms part of the transport network between Porto and Vila Nova de Gaia, which is too far upstream to be visible from Porto: the Ponte do Friexo (Friexo Bridge.) It, and the Ponte de Arrábida, form part of a ring-road freeway that circumscribes Porto and Vila Nova de Gaia. 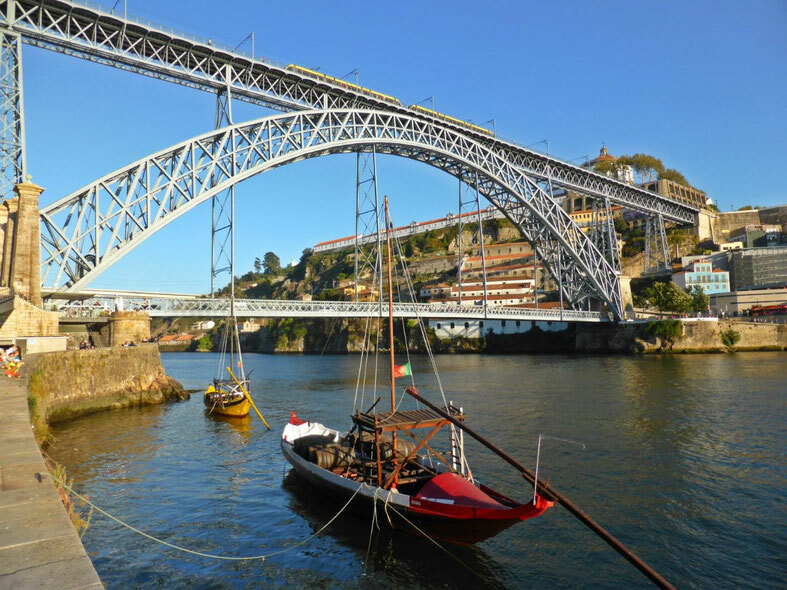 The bridges of Porto and Vila Nova de Gaia are perhaps so interesting partly because they are all soaring bridges that terminate on high river banks. They're also an eclectic collection, so that every time another bridge enters your field of view, you are surprised by the visual contrast with the ones that you have seen previously. What do you think? Put your thoughts into the comments below! Fabulous photos Chris! Have you seen the Banghwa Bridge in Seoul, South Korea? It's also probably an Eiffel influenced design. It's a must see and painted a startling orange colour. 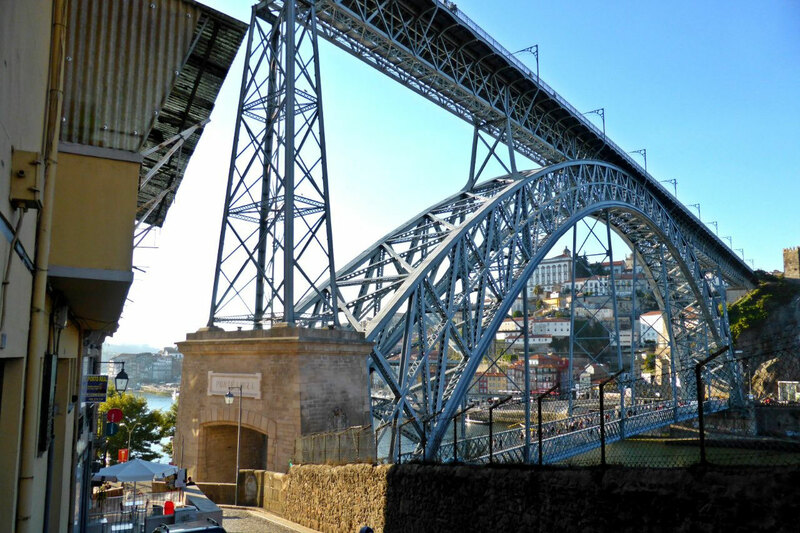 Thanks Jim; I reckon that I could survive jumping from the lower deck of Ponte Luís I! Chris, what a massive collection of bridges in one place. I think the Coathanger's air clearance (used to calculate unimpeded maritime passage) is just about 50 m - for Qlders the Story Bridge is just over a piddly 30 m. Ponte de Arrabida's whopping 70 m would make for one helluva bungee jump...and subsequent total hip replacement, I suspect. Glad the bridges were safer for you all!